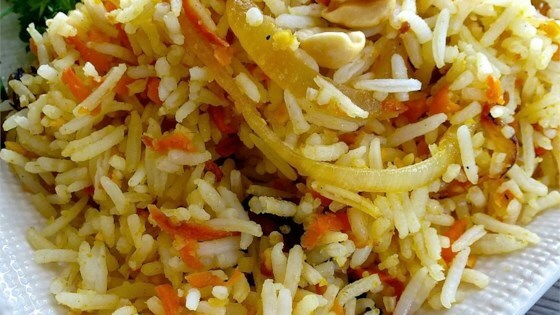 "Fragrant basmati rice sauteed with carrots, onions, fresh ginger, peanuts, and cilantro. You will be surprised to taste this delicious rice." What a wonderful change from plain rice! Tasted even better the second day! WOW!!! This was to die for! I served it with "Baked Sesame Chicken" from this site, and green peas. Thanks so much for the recipe! This recipe is a great way to spice up rice. I loved it. I used cashews instead of peanuts.